1. Boom to bust: Wall Street is cheering the rapid rise in crude oil prices, even if drivers aren't. Investors are already piling back into Big Oil stocks, a bet that crude's 50% spike in the past year will mean fatter profits and bigger share buybacks. Oil hit $70 last week, and it helped carry the stock market to its best week in two months. Higher oil prices are undoubtedly a huge positive for the notoriously boom-and-bust oil industry — and its millions of workers. Those fortunes are being shared even more across the country thanks to surging US oil production from the shale boom. Oil's comeback is also evidence of an economy that's humming along, and requiring more and more crude. But that formula only works for so long. At a certain point, higher oil and gasoline prices will become a negative — for the stock market and the economy alike. Pain at the pump eventually eats into consumer spending, the main driver of the economy. "You can't argue crude going up every day is a good thing for the US consumer, who has little wage growth and record debt," said Ian Winer, head of equities at Wedbush Securities. Gasoline prices are up 22% this year to a national average of $2.86 a gallon, according to AAA, even before President Trump's sanctions on Iran take effect. Drivers in 10 states are already paying $3 or more. Higher gas prices are on track to cost Americans an extra $38 billion in 2018, erasing about one-third of the direct benefit from President Trump's tax cuts, Morgan Stanley estimates. Of course, oil and gas prices are nowhere near the extremes of 2008. And just two years ago Wall Street was freaking out about the oil crash, when crude plunged to $26 a barrel. 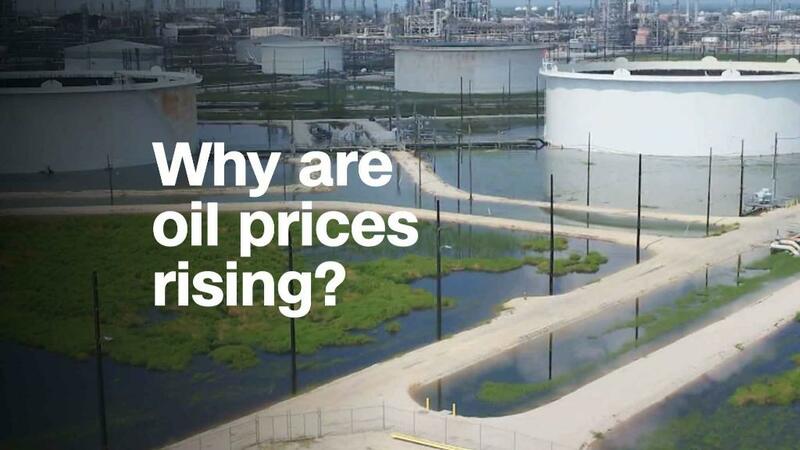 Still, all of this raises the question: How high is too high for oil? Rather than a specific price, pay attention to the speed of the increase. It's less of a shock if the change occurs over time. Nicholas Colas, co-founder of DataTrek Research, notes that the US economy tipped into a recession in 1990 when Iraq's invasion of Kuwait caused oil prices to hit $40 a barrel, more than doubling in just three months. History shows that when crude spikes by more than 80% in a year, it can pose serious problems, according to Brad McMillan, chief investment officer for Commonwealth Financial Network. "This has been a reliable signal of past recessions," McMillan wrote to clients last week. Crude was fetching about $47 a barrel a year ago. That suggests the price to watch is about $85 a barrel. That's roughly 19% above current levels. Even if crude rises that high, it could take time before the economic shockwaves reach Wall Street. "For the moment, we're not close to the danger zone," McMillan said. 2. Big businesses sound off on tariffs: US trade officials plan to hold hearings this week to discuss proposed tariffs on $50 billion worth of Chinese goods. Companies and lobbying groups are expected to attend — and they'll have a lot to say. Corporations have warned that the tariffs, which are meant to punish China for intellectual property theft, could lead to higher prices for Americans and harm the economy. The Business Roundtable, which represents top CEOs, said in April: "Unilaterally imposing $50 billion of new tariffs without a long-term strategy that leads to economic reforms in China will only hurt America's businesses, workers, and families." It's still not clear when the tariffs would take effect. President Trump's top economic adviser, Larry Kudlow, said in April that Americans are "not likely to see any definitive actions for a couple of months." 3. Macy's and Nordstrom report earnings: Both retailers are struggling to compete with Amazon (AMZN). They'll give investors an update this week. Macy's (M) has tackled the Amazon problem by selling real estate, shutting stores and investing in digital. Sales climbed last quarter, and the stock has risen 18% this year. Analysts say Macy's still needs to do more. Morgan Stanley (MS) downgraded the stock last week, giving it an "underweight" rating. Nordstrom (JWN) just opened its first-ever standalone men's location, a gadget-heavy store in New York that's designed to lure shoppers with a unique experience. Investors will want to know how customers are responding. 4. Retail rebound: The US Census Bureau is scheduled to release retail sales figures for April on Tuesday. Morgan Stanley analysts are expecting a rebound in consumer spending in the second quarter, led by an increase in sales at home improvement stores. That would bode well for Home Depot (HD), which reports earnings on Tuesday.